Talking about the Jury house. Ian wonders if AShley and jenn are “Getting into it”. Danielle thinks so they didn’t leave on good terms. Ian explains he meant “Getting into it” Ian implies romantically. Shane doesn’t think so says that Ashley wasn’t gay. Ian thinks they were interested in each other. Dan tries to feed her some sweets.. The Big Brother 14 Live Feeds Are BACK ON! The FINAL 4 With One Week Left! 9pm When the live feeds come back, Dan, Jenn, and Shane are in the living room talking about Jojo. Ian is in the diary room. Danielle brings up how Jojo told her that she is the type of girl that guys cheat on. Shane says that Jojo was too much for him, he could never date a girl like her. Danielle brings up how Jojo liked an*l and told Danielle not to knock it till she tried it. Dan keeps asking what other questions they were asking that night. Danielle says spit or swallow, have you ever done it in a public place, etc. Dan asks Danielle if she thinks Jojo ever made out with Willie. Danielle says that she thinks she did, Willie tried to make out with all the girls. Shane tells Dan how he thought about coming into the house acting like the gay guy. Dan asks do you think you could keep that up 24 hours a day. Why the Live Feeds Are Showing TRIVIA & What’s to Come in the Final Week Of BB14? Last year, at this time the live feeds were blocked at about 2pm and didn’t come back until Wednesday nightafter the show aired on the east coast. We would expect by Wednesday night at that time, Jenn will be evicted, a new HOH and POV winner will be known. What’s to come on the FINAL week of Big Brother 14? Up until now the live feeds have had a pretty set schedule, however, from here on in the remaining days of the season move at an accelerated pace. 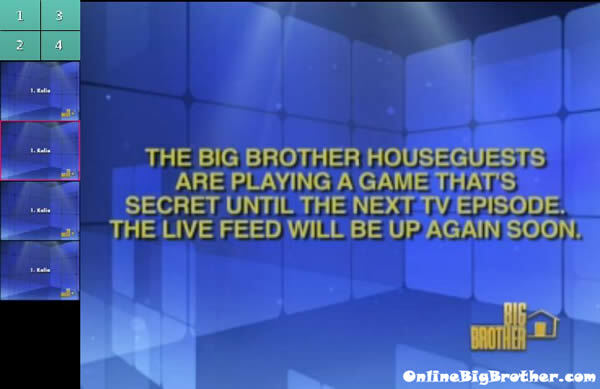 The live feeds are blocked (TRIVIA) to tape the eviction episode that will air tomorrow night (Wednesday). Re-Watch ALL THE BB14 DRAMA on FlashBack: FREE 3 Day Trial! They are crapping their pants about being woken up so early. Danielle thinks that it’s goign to be a fast forward. Shane says 2 double evictions and a fast forward in one season is TOO MUCH. Jenn joins them asks if they will have a luxury competition this late.. Danielle doesn’t think so because there has been so many prizes lately. Jenn thinks it will be a fast forward.